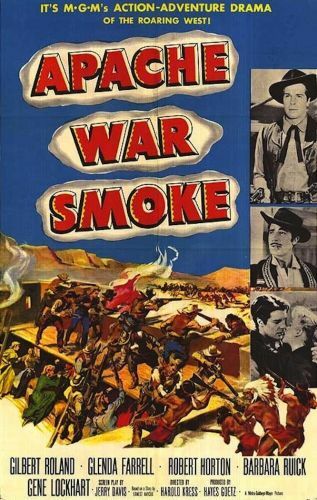 Apache War Smoke was a remake of Apache Trail (42); both films were based on a story by Ernest Haycox. Haycox had previously written Stage to Lordsburg, a western yarn filmed by John Ford as Stagecoach (39). Apache War Smoke adheres to the Stagecoach formula by trapping several strangers in a dangerous situation, in this instance an incipient Apache uprising. Included in the group are the passengers of a stagecoach, and the gang of bandits who've just held up the coach; there's also a notorious Indian hater in the bunch. Apache War Smoke spins its yarn in a brisk 67 minutes, with only a few slow stretches here and there.